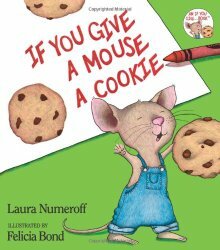 When I explained to my family that I am writing a series of posts about classic picture books, my youngest son told me that I must include If You Give a Mouse a Cookie and my husband immediately added that he always enjoyed reading it aloud. If you sit down outside your house to enjoy a chocolate chip cookie and if a mouse in blue coveralls should appear you will, of course, be tempted to share the treats. It won’t be long ’til you are headed into the house to satisfy your guest’s need for a glass of milk. It is almost impossible for a mouse to drink from a tall glass so he’ll ask for a straw and then a napkin (to eliminate a milk mustache). Delightful illustrations enhance this wonderful, circular story and add extra “inside jokes” that children will enjoy. Who could imagine that when the mouse decides to trim his hair he will find so much to cut and scatter around the otherwise neat and tidy bathroom? The young boy whose generosity led to an ongoing “make work project” is kept running as his small companion’s demands continue. Great fun for children aged four years and up. 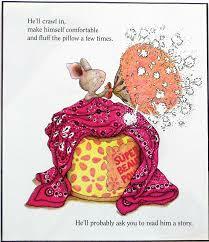 Follow Storytime Standouts’s board If You Give a Mouse a Cookie on Pinterest.